The US diplomat has undertaken to coordinate the sequence of peaceful settlement in Donbas. U.S. Assistant Secretary of State for European and Eurasian Affairs Victoria Nuland arrived in Kyiv on Wednesday, the U.S. Embassy in Ukraine told an UNIAN correspondent. "Nuland arrived in Kyiv at about 13:00," the Embassy said. 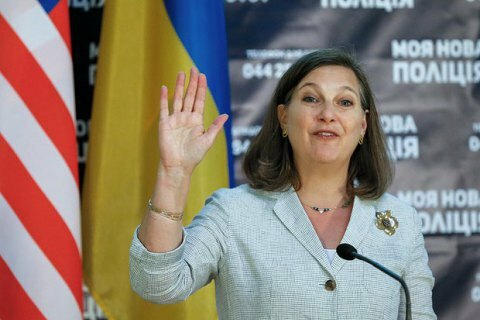 It is expected that Nuland will discuss with representatives of the Ukrainian authorities the situation in the east of the country, the implementation of the Minsk agreements, as well as the issues of bilateral relations. On Wednesday, Nulan is scheduled to will meet with the Chairman of the Verkhovna Rada Andriy Parubiy. Nuland is expected to meet with representatives of the Ukrainian government and the Presidential Administration of Ukraine, but this information is yet to be officially confirmed. Earlier on the day, the Ukrainian presidential office has confirmed that President Petro Poroshenko does not plan to meet with Victoria Nuland on Wednesday.